Very welcoming office setting. Waited less than 10mins while i finished the paper work. Doctor was very knowledgeable andgave a better understanding of the whole process i was going to require and most importantly his assisstant gave me a total breakdown of the costs of each precedure. 9.5/10 . Very welcoming office setting. Waited less than 10mins while i finished the paper work. Doctor was very knowledgeable and gave a better understanding of the whole process i was goingto require and most importantly his assisstant gave me a total breakdown of the costs of each precedure. 9.5/10 . He was very professional! Didn't give me the dreaded dentist lecture either that gives so many people anxiety about goingto the dentist. I absolutely recommend him! He was very professional! Didn't give me the dreaded dentist lecture either that gives so many people anxiety about going to the dentist. I absolutely recommend him! ****This practice has a 48 hr cancellation policy****** Dr. Dan C. Paik D.D.S. of Apple Dental has been working as a general dentist for more than 22 years. He designed his office to provide state-of-the-art dental procedures. 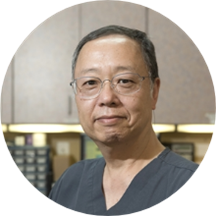 As a long-term advocate of advanced dental technology, Dr. Paik practiced dentistry for 22 years in Las Vegas and prior to that practiced for 8 years in California's San Fernando Valley. Graduating college as a region scholar in ONLY 3 years, Dr.Paik received the Magna Cumlaude as well. Dr. Paik is amazing. He was so informative and really catered the experience to my preference. I was not pleased I still have my tooth issue. I am very happy with all of the staff. They addressed my problem and I am very happy with them. I felt very comfortable and he listened to my concerns! Very friendly and professional staff. Will definitely use this provider again.